Home|The Flower Lovers Blog|Meet a Member of the Calyx Flowers Team! Today we thought we’d introduce you to a member of our esteemed Calyx Flowers’ team – his name is Brian Goodhue and he is our resident marketing whiz. Not only is Brian our number one numbers guy, he has quite a green thumb – two actually. 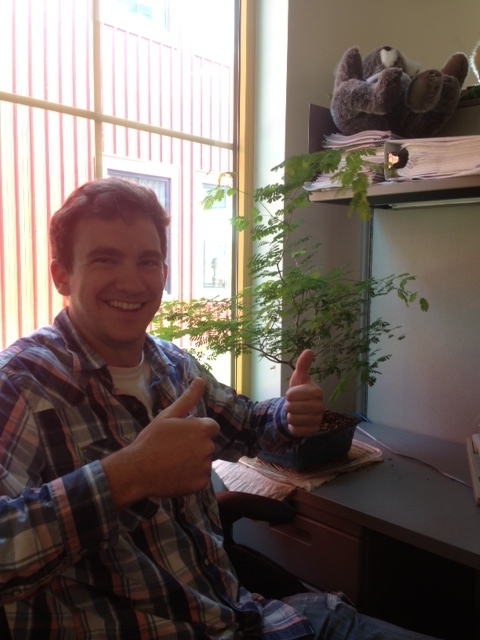 As you can see, he has taken good care of his Brazilian Rain Tree bonsai and it is growing quickly! At Calyx Flowers, we not only provide flowers to our customers, but we truly love all plant life as well and like to keep our offices adorn with fresh flowers and plants when we can. We know the number one tip to keeping our flowers blooming and our plants growing is tender love and care. Check out our website for specific tips on your plant or flower order! We want you to keep your beautiful gift for as long as possible.